What foods to eat during your first trimester? recipes Indian Diet. What foods to eat during your first trimester of pregnancy? 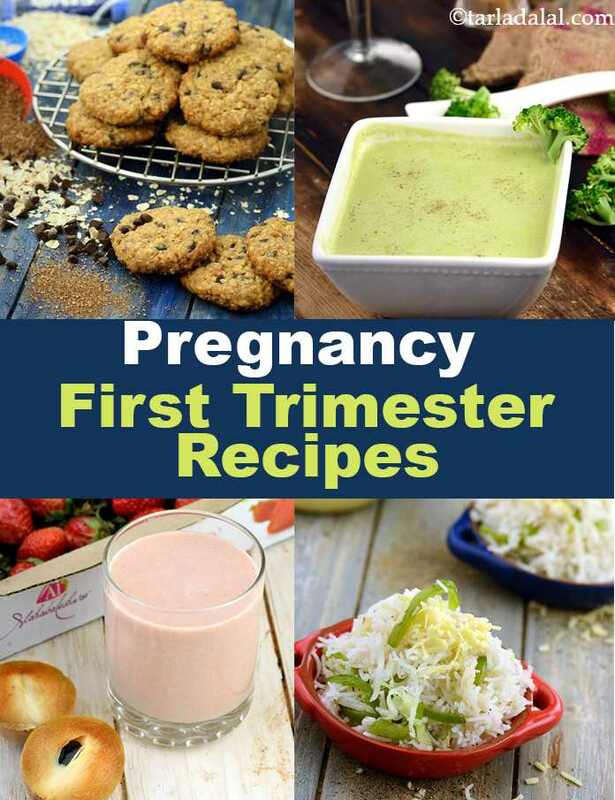 first trimester pregnancy recipes, 1st trimester Indian pregnancy foods. The first 3 months of pregnancy are called the “First Trimester”. Throughout the Pregnancy, your baby needs a ready supply of energy and a high quality of nutrients for its growth. It is during the first few weeks that the fetus begins to form organs and the heartbeat can be detected by the second month. Along with protein, calcium and iron, with more focus on folic acid which is essential for the brain and spine development of the fetus. Healthy Tomato Soup, Palak Toovar Dal and Til chikki are a few well researched recipes just for you to make up for your folic acid requirement. 1) Cereals and whole grains : It is recommended to consume about 6-7 servings of cereals per day. Cereals provide you the necessary energy which is required in increased amounts during pregnancy. They also provide fibre which will keep constipation at bay. Include a variety of whole grains like wheat, barley, bajra, ragi in your diet and avoid refined products like maida. 2) Pulses and legumes : It is recommended to consume about 1-2 servings of pulses per day. They are vegetarian source of protein and hence should be used in combination with cereals to enhance the protein quality. Dals like mung, masoor, toovar, pulses in the form of sprouts or as whole are good to go in salads, pulao’s and sabzi’s. 3) Milk and Milk products : It is recommended to consume about 2-3 servings of dairy products per day. They provide high quality proteins and calcium. Calcium and protein requirements also increase during pregnancy to support the growth and development of the foetus. So it is suggested that you eat dairy products like milk, yoghurt, paneer etc. 4) Vegetables : It is recommended to consume about 4-5 servings of vegetables per day. Include a variety of colourful vegetables to get a wide range of nutrients. Choose all types of vegetables like leafy ones such as spinach, methi, cabbage, lettuce etc. greens such as capsicum, broccoli, peas etc, orange ones like carrots and pumpkin, reds like tomatoes and red capsicum, yellow such as corn and yellow capsicum, purple like brinjal and purple cabbage etc. 5) Fruits : It is recommended to consume about 3-4 servings of fruits per day. Fruits provide a variety of nutrients and antioxidants too. Just like vegetables, one should consume a variety of colorful fruits too to make your diet colorful like a rainbow. Fruits like apple, pineapple, pear, oranges, guava, watermelon, grapes etc. During these early months you may feel nauseated and want to throw up frequently. If you are one amongst those women, trying chewing on cardamom or opt for dry snacks like Bajra Khakhra, Golpapdi etc. Sipping water, Juices or shakes from time to time will also help to keep nausea at bay. Turn to healthy options like Strawberry Chickoo Milkshake, Fig and Apricot Shake or try your hands on any combination of fruits available in your refrigerator. These don’t have strong flavor and lack strong smells which avoids aggravating nausea. It is likely that you lose weight in the beginning months, but remember to continue with fluid intake along with small and frequent meals. Recipes like Broccoli and Baby Corn Stir-fry, Cucumber Curd Rice, Jowar Bajre ki Roti and many more will help you gain those necessary nutrients for you and our baby both. You can try meditation or yoga under expert supervision along with a healthy diet – it will help keep you relaxed and reduce stress. Enjoy our range of recipes foods to eat during your first trimester and check out our other pregnancy recipe categories. Tired of dal-chawal? Then this is just the thing you need. A simple stir fry with oriental origins that is rich in fibre, folic acid, protein and above all taste. Toss in some noodles if you want to make a bigger meal of this dish. We have made a quick and healthy version of the lip-smacking rajasthani snack by dressing up protein and iron rich besan and methi leaves in enticing, tangy flavours. All the fibre makes this a good choice for diabetics too.